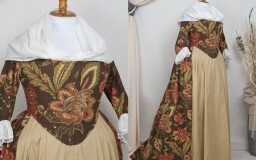 This is the reproduction of a Robe á la Francaise from the early to mid 1740ies, made for a very dear client. At this time in the mid 18th century the winged cuffs were still in fashion, but shortly after discarded in favour of the ruffled ones everyone knows and regards as iconic for the whole rococo-fashion. 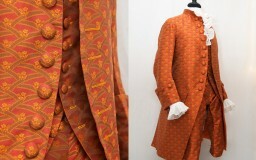 Another typical feature of a robe from this time are the double robings (the long pleats in front), rather wide Watteau-pleats in the back, a square neckline not showing too much decolleté and no frills and other kinds of decoration. The robe is almost closed in front and there are no seams along the waistline in the front parts. The latter results in littles creases along the waist. 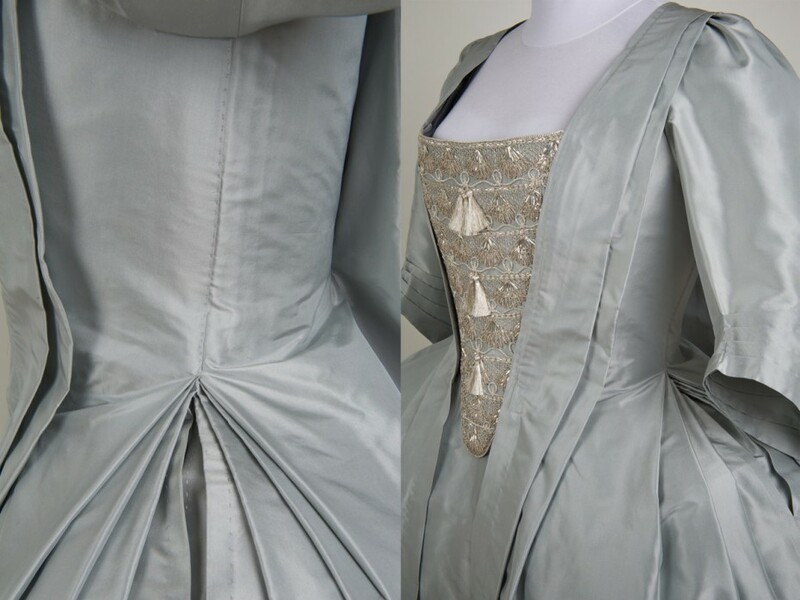 The stomacher does not feature extra tabs on the lower edge any more and it is rather pointy. 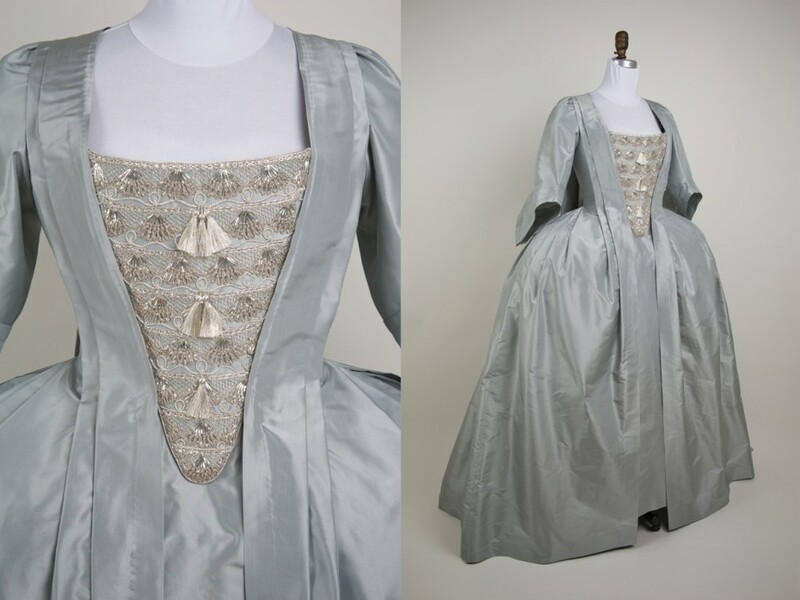 Due to the plain fabric this would not be a dress noble enough to be worn for very formal occasions but rather as neat daywear. So my client asked for a panier of moderate width. 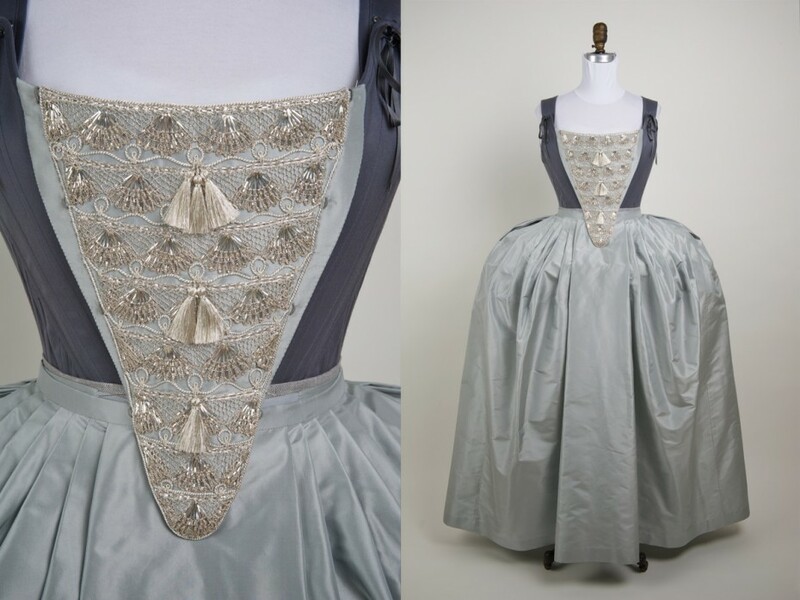 The only dashing part is the stomacher, embroidered with handmade real silver bobbin lace, silver bouillon, tassels and twine. I’ve tried to be as historically correct as possible, but I’ve used some modern techniques in the invisible parts as well. 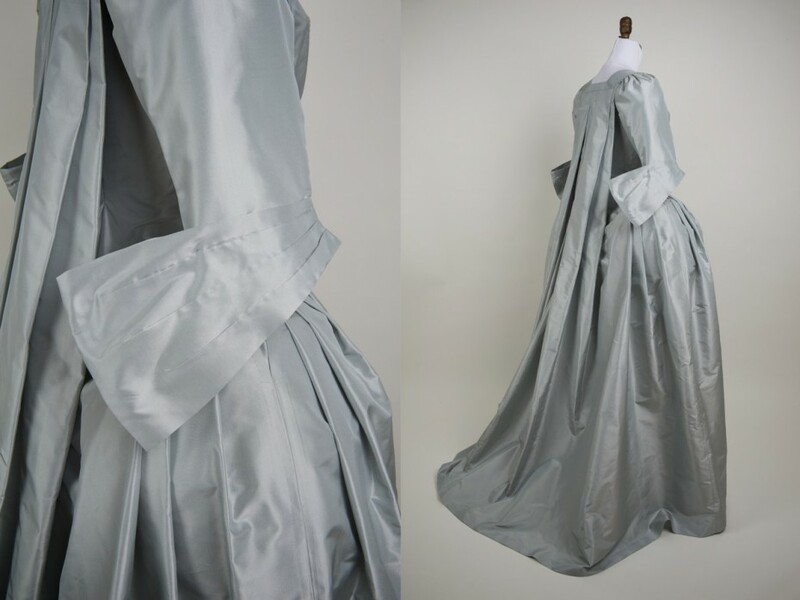 So the whole robe and petticoat is almost entirely handsewn (using historical stiching) – except for the long seams and the lining. I’ve used metal grommets for easy lacing. 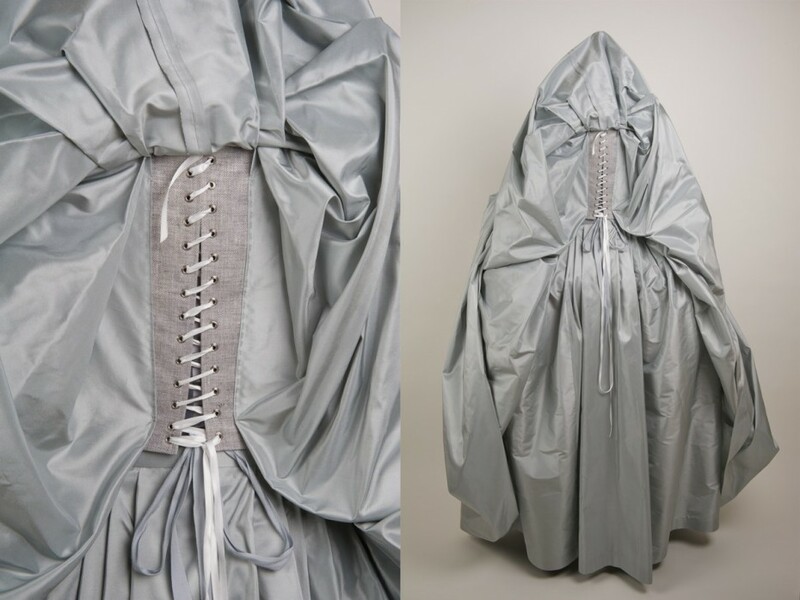 The robe itself is not closed by using lots of pins. We’ve chosen hooks and thread-loops instead – this is not the typical method but not completely wrong either. 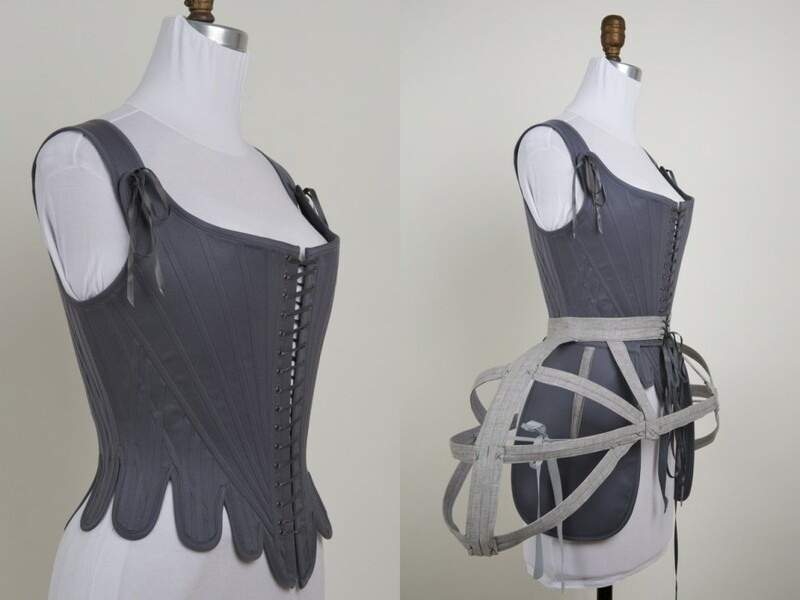 (Closing the robe by pinning instead of hooking it to the stomacher makes both just more versatile – you can easily choose any robe-stomacher-combination you like and you do not need to care, if the closure matches or not). 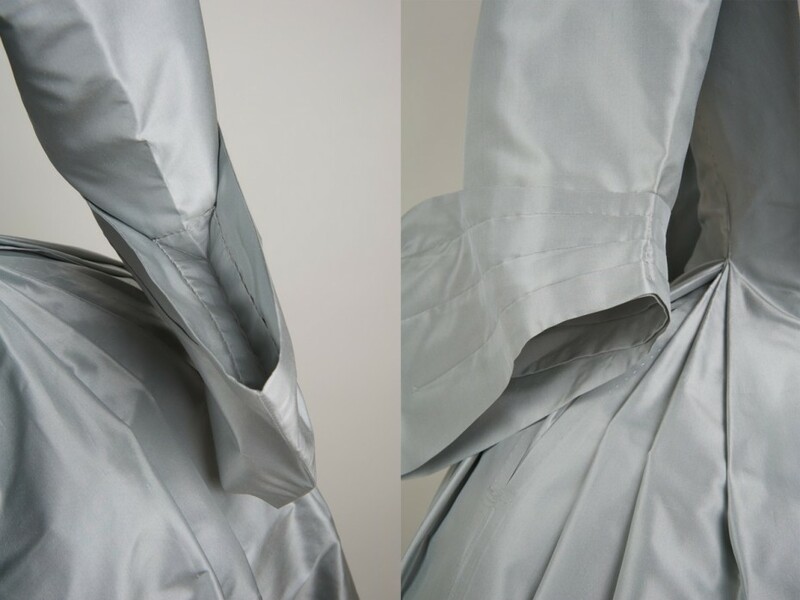 The sleeves are set in in the typical fashion of the 18th century and it took me quite some pondering to find a way, how this could be done when you do NOT have a separate piece on the shoulder but the whole front in one. It’s a bit difficult to describe but I’ve taken photos and will show you next time. 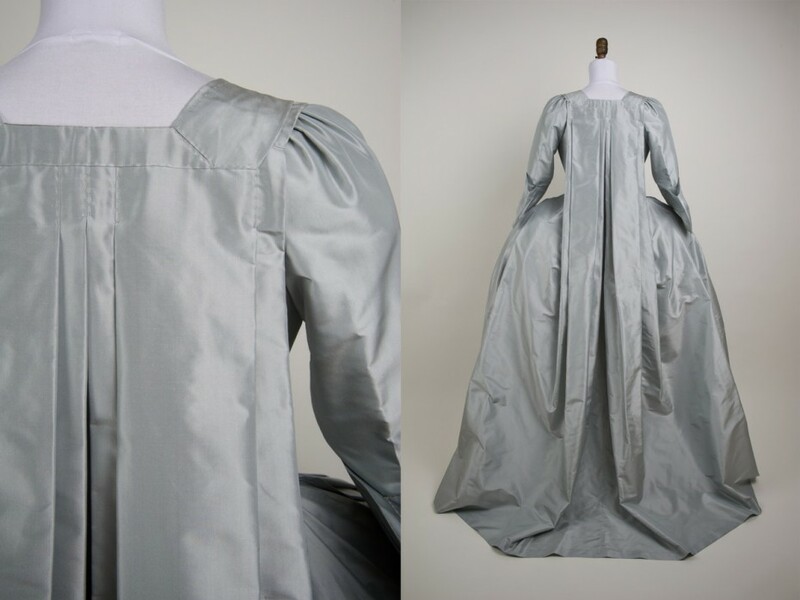 The upper material is a heavy weight and very stiff pure silk taffeta, the robe is lined with herringbone linen, sleeves are lined with softer plain-weave linen. 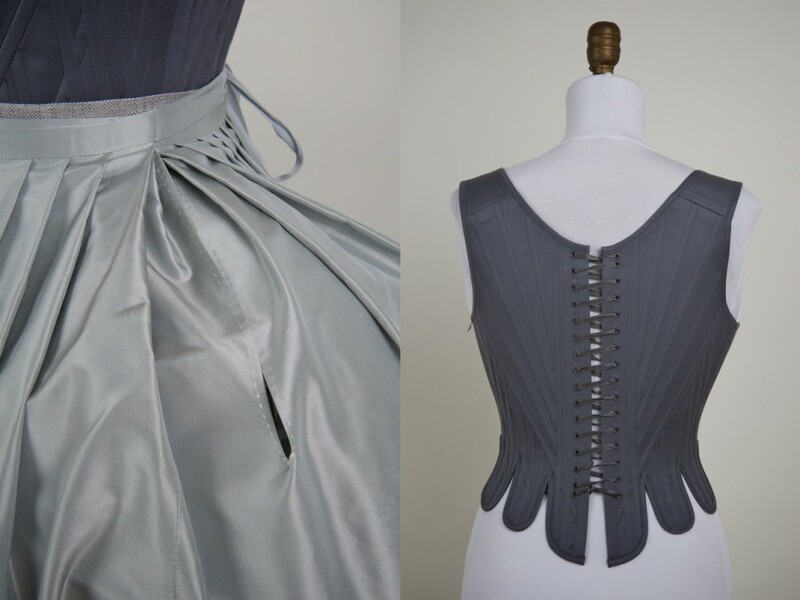 The pair of stays is made of herringbone coutil and grey wool satin and comes with a matching pair of pockets. 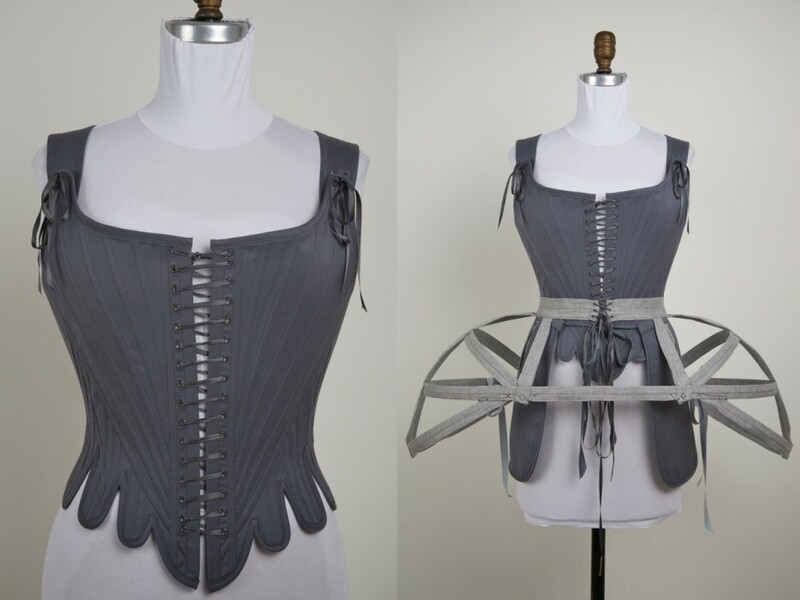 It’s entirely machine-sewn and also meant to be worn as modern eveningwear. The panier is of my very own construction and made of herringbone linen. I’ve developed this special shape and construction several years ago in order to achieve a perfectly rounded silhouette – see, it works fine!